When I was invited to join Christy from OrdinaryTraveler.com to visit North Vancouver Island, I jumped at the chance. Here was my opportunity to discover more of British Columbia, a part of the world of which I had seen such a small part. Our adventure began when we flew out of Vancouver’s Terminal 2… a small space with even smaller airplanes taking off. The hour-long flight was gorgeous, gliding over an archipelago below. We landed in Port Hardy on North Vancouver Island just as the sun was setting. Truly spectacular! “Keep your eyes open for deer and bear on the roads,” the guy at the car rental counter advised when we picked up the keys. “It’s dusk and they’re more apt to be out.” Deer, yes. But bears – where were we headed?! After an hour’s drive into the dark we arrived in Telegraph Cove, a charming waterside village established in 1911 when the first telegraph operator moved in. The old fishing village (population: 20) has been turned into a resort and is now a launching point for eco-tourism. A boardwalk lines the property, and historic, rustic cabins dotting the hillside. The main office was closed when we arrived, and the keys to our cabin were left hanging on the office door. Honesty is the best policy! 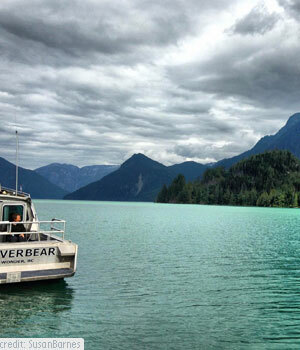 The real draw of Telegraph Cove and North Vancouver Island is its wild adventure offerings. Of course, Mother Nature plays a big role here, and our kayaking expedition was cancelled due to rough waters. Instead, we embarked on our full-day grizzly bear tour with Tide Rip Grizzly Tours. After an hour or so making our way up Knights Inlet by boat – and spotting a white wolf standing stoically on a point overlooking the water, like “seeing a unicorn,” according to our guide Derrick – we arrived at a floating dock and boarded the skiff. Matt and Pascal, two of our other guides, effortlessly took us up the Glendale River. When they spotted two grizzly bear brothers, they cut the outboard motor and quietly lowered themselves into the water, pushing and pulling the skiff into position for better viewing. The only sounds, other than the bears rustling the tree branches and splashing into the water, were shutter clicks of cameras catching the scene. Over the next hour or so, Matt and Pascal guided our skiff further up the river where we happened upon two grizzly mama bears and their two sets of cubs. 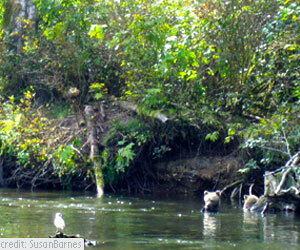 They were feasting on spawning salmon and roughhousing with their mamas, and each other. It was mesmerizing, watching the bears in their natural habitat, going about their business. What I was most impressed with was that Tide Rip was acutely aware to not disturb the bears in any way – they’re very respectful and ensure that there’s no human influence on the bears in any way. Nature, respected the way it should be. I hadn’t known much about grizzly bears prior to our outing, but I’m now even more respectful of them, and can’t wait until there’s another opportunity to see them – from a distance! – in their natural surroundings. Wow! So lucky to experience these amazing creatures first hand in the wild. The water looks so beautiful. …peaceful! Lions and tigers and bears, oh my! This is a very interesting and informative post. Thank you for sharing. Vancouver Island is a wild place! Fab post, I have a love/fear relationship to bears so I’m always fascinated to read about them.